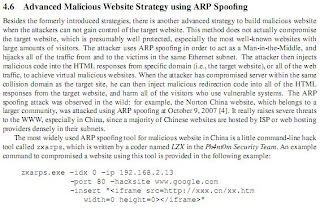 其實我們也沒有說過他們不是用ARP spoofing來intercept哪些packet. 都有可能, 也有可能是router被crack, 也有可能是跟router同意個segment的windows machine被crack. 這個不是其實一個重點. 重點是他們(bad guys)有辦法在哪些7個hop內"聽"我們的TCP session. HOW: 這個問題, 如果中華電信不給我們跟系的資料, 很難說. 他們說'都是hardware", 那就是router紴控制. 如果有ethernet segment, 也可以用arp來做interception. 不過如果你用arp做interception, 你可以完全控制tcp connection. 我們這邊不會看到spoofed packet 跟 real packet一起出現. 有可能他們欄的做full tcp connection hijacking, 所以決定用spoofing送packet, 然後其他的traffic直接給那個機器處理. 其實我玩過那個zxarps. 哪個tool很強, 她正個tcp session都可以handle. 如果他們會用那種方式來打, 這個問題就會跟難解決..
關於道德: 我們沒有在disclose漏洞. 而且我們早已天跟中華電信聯絡過, 但是他們都說"沒有問題". 這種situation你覺得應該要怎麼handle? 某公司非官方總裁實在是太有意思了, 在自己的非官方 blog 信誓旦旦寫說攻擊發生在 TTL < 7 的範圍內, 但接受別人訪問時又說攻擊是從新加坡的一台 switch 發動的, 真不知道這是在自打嘴巴還是騙台灣人看不懂英文？訪問內容在此.